The colours and atmosphere of buildings by legendary Mexican architect Luis Barragán are captured in these realistic model photographs by American artist James Casebere, set to go on show in New York. Casebere recreated elements of Barragán's iconic buildings to create the body of work for the exhibition, titled Emotional Architecture. "The title of the exhibition references the name given to the style of modernist architecture conceived by Barragán and the artist Mathias Goéritz, who, frustrated by the cold functionalism of modernism, embraced space, colour and light to create buildings that engendered warmth, meditation, and reflection," said Sean Kelly Gallery, which will show the images later this month. To produce the images, Casebere employed a method known as constructed photography. The artist builds complex table-sized models of the interiors in his studio, using everyday materials. He then photographs them in a way that aims to recreate the lighting conditions and atmosphere in the spaces. In each case, the rooms and areas are pared down to their essential elements, and shown devoid of furniture or inhabitants. "The resulting images invite viewers to project into and inhabit the spaces he has created, relying on their imagination and memory to fill in the gaps," the gallery said. The portions of the Pritzker Prize-winning architect's projects reproduced for the series include the yellow corridor at Casa Gilardi, which was completed in 1976 and was the last project he oversaw. The bachelor pad turned family home in Mexico City was also recently captured in a short film. Areas from the house Barragán built for himself in the Mexican capital in 1947 are also interpreted. The first is the vestibule, which features pink, yellow and white walls illuminated by a skylight above the staircase. The second from Casa Barragán is the library, a simple space with a wooden ceiling and white walls that are awash with daylight. 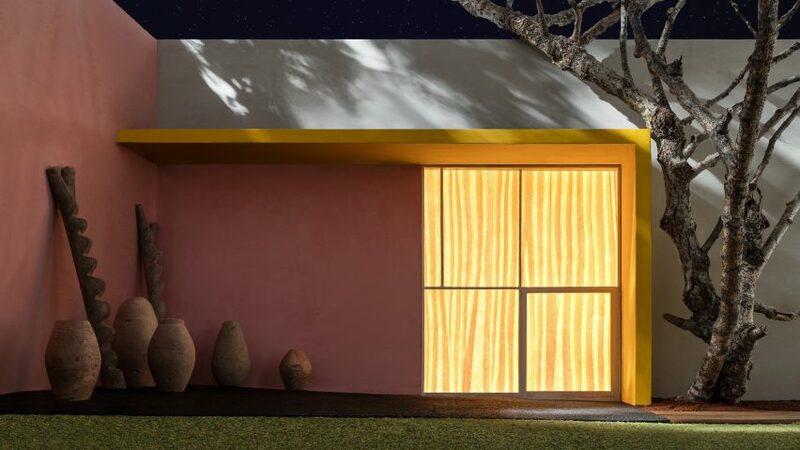 Images showing a window with a cross-shaped that looks onto a pink-lined courtyard, and a yellow canopy overhanging an outdoor space, are both based on the 1955 Casa Gálvez. Casebere is renowned for his interior studies, with previous projects including an examination of prison cells. Examples of his work can be found in the collections of museums in including the Whitney, Guggenheim and MoMA in New York, and the V&A and Tate in London. "In this new body of work, Casebere returns to his career-long interrogation of interior architectural spaces to explore Barragán’s sumptuous use of color, dramatic light and simple haptic, planar surfaces," said Sean Kelly Gallery, which will host the exhibition from 27 January to 11 March 2017. New York was also the location of Barragán-focused exhibition last year. The show at the Timothy Taylor gallery space in Chelsea explored the architect's use of colour, alongside the works of prominent artists. Images are copyright James Casebere, courtesy of the artist and Sean Kelly, New York.